Israeli Soldiers Invade Jerusalem Al-Aqsa Mosque. Deliberate Provocation. What is Israel’s Hidden Agenda? 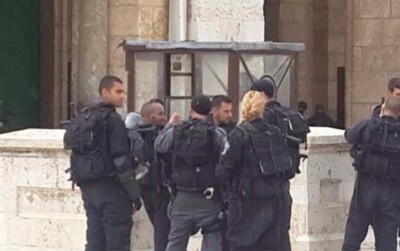 Dozens of Israeli soldiers invaded, on Wednesday morning, the grounds of the Al-Aqsa Mosque in occupied Jerusalem, assaulted the worshipers with concussion grenades, gas bombs and rubber-coated metal bullets, and invaded the main mosque within the compound. The Maan News Agency said dozens of soldiers invaded the yards of the mosque through the al-Magharba Gate and the Chain Gate (Bab as-Silsila) and assaulted dozens of worshipers who managed to reach the mosque yards. Sheikh Azzam al-Khatib, head of the Islamic Waqf and Endowment in Jerusalem, stated that dozens of soldiers invaded the al-Qibli mosque while heavily armed. Al-Khatib denounced the military desecration of the mosque, and this serious violation, especially since the soldiers violated the sanctity of the mosque, wearing their shoes and carrying their weapons into the house of prayer, in a serious escalation and assault. Eyewitnesses said clashes took place inside the al-Qibli mosque of Al-Aqsa and that the soldiers fired dozens of gas bombs and concussion grenades at the worshipers causing several injuries. Two people suffered serious head wounds, and one who was shot in his eye. Palestinian medics rushed to the scene, but the soldiers prevented them from entering the mosque compound for more than 30 minutes before they decided to allow just one doctor and a nurse to enter. Initial reports indicate that around 40 Palestinians have been injured. The soldiers then closed the gates of the al-Qibli mosque with chains and iron bars, and hurled concussion grenades at the mosque guards. Earlier on Wednesday at dawn, the soldiers prevented all Muslim men below the age of 50 from entering the mosque, and allowed the women through only after withholding their ID cards. Following dawn prayers, Israel prevented all worshipers, including Waqf Department employees and around 500 Sharia students, from entering the mosque. The soldiers opened the mosque more than an hour later following extensive talks. The soldiers also closed all gates of the Al-Aqsa Mosque, except for Bab Hatta, Bab Al-Majlis (Council Gate) and Bab as-Silsila (Chain Gate). In related news, dozens of Israeli fanatics invaded the yards of the Al-Aqsa Mosque, amidst extensive police and military deployment, and toured in the area amidst calls for more extensive invasions of the Mosque compound. Also in Jerusalem, Israeli soldiers demolished an under-construction Palestinian home in the at-Tour neighborhood in occupied Jerusalem. The soldiers also kidnapped at least 17 Palestinians in occupied Jerusalem, and Abu Dis nearby town.